As seen in today's New York Times: You go, Chuck! 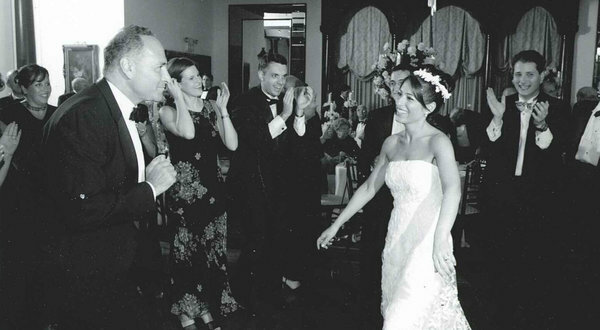 Mr. Schumer, left, dances at the wedding of Cathie Levine, a former staff member. Even by the standards of Capitol Hill, where ambitious and awkward young people are thrust together in cramped workplaces and crowded bars, the nuptial output of Senator Charles E. Schumer’s office stands out. For his part in their union, Elizabeth and Farrell Sklerov honored Mr. Schumer by naming their dog after him. 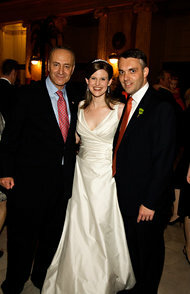 Mr. Schumer at the wedding of Elizabeth Stanley and Sean Sweeney. The senator would press Mr. Sweeney to propose. “He would just keep saying, ‘Let’s go already,’” Mr. Sweeney said. Schumer staff members, put simply, like to marry each other. There have been 10 weddings so far, and two more scheduled this fall — an average of nearly one “Schumer Marriage” (his term) for each year he has spent in the Senate. Cupid’s arrow lands where it will, but many of the couples say that Mr. Schumer, a New York Democrat, has an unusual knack for guiding its journey. He keeps close track of office romances, quotes marriage-friendly Scripture (“God to man: be fruitful and multiply”), and is known to cajole, nag, and outright pester his staff (at least those he perceives as receptive to such pestering) toward connubial bliss. Forget Master of the Senate. This is the Yenta of the Senate. The encouragement rarely stops at the altar. Mr. Schumer is described by aides as a fabulous wedding guest, quick to request a Jefferson Starship song from the D.J. and eager to dance with the bride. And his focus, like many a politician’s, never strays far from his legacy: first comes Schumer Marriage, then come Schumer Babies. In an interview in his Manhattan office, Mr. Schumer grinned and giggled as he recalled the couples he had brought together. Mr. Schumer, who prides himself on training the next generation of Democratic leaders, runs his office like a Congressional West Point: boot-camp hours, sky-high expectations, and a powerful alumni network. Mr. Sweeney runs a major “super PAC” that supports President Obama; another alumnus, Josh Vlasto, is the press secretary for Gov. Andrew M. Cuomo, and he plans this fall to marry Megan Murphy, Mr. Schumer’s scheduler. But in between teaching the art of press strategy and budget talks, “Chuck,” as his young staff members call him, likes to impart a different kind of counsel: how to live well. His matrimonial maxims are repeated so often that staff members can finish the lines for him. The two were mortified, although happy with the enormous grin on Mr. Schumer’s face. The senator later signed the ketubah, a Jewish marriage contract, at their wedding, and stayed late at the reception. “I have pictures of him doing the Love Train,” said Mr. Isay, now an influential political consultant in New York. Four of the couples interviewed for this article recalled similar experiences. “I just about tried to melt into the floor,” laughed Moira Campion McConaghy, whose relationship was revealed by the senator at a holiday party. Later, when she and her boyfriend told Mr. Schumer they were engaged, the senator began recommending reception halls near Ms. McConaghy’s hometown, Endicott, N.Y. “He was bringing his knowledge of the entire state to our wedding planning decisions,” said Ms. McConaghy, now the legislative director for Senator Jeanne Shaheen, a New Hampshire Democrat. But Mr. Schumer likes to keep a thumb on the scale, interrupting late-night policy meetings to grill aides for gossip on potential couples. And he occasionally counsels against choices that he deems questionable. “Marry a solid, good person,” he says. Daniel Squadron, a former assistant to the senator, was set up by Mr. Schumer and his wife, Iris Weinshall, a former New York City transportation commissioner whose chief of staff, Elizabeth Weinstein, had caught Mr. Squadron’s eye. If Ms. Weinshall called, Mr. Schumer “would ask with a giggle if I had spoken to Liz,” Mr. Squadron recalled. Once, all four bumped into one another at a Starbucks. The senator “was clearly proud of how flustered we were,” Ms. Weinstein recalled. Years later, after the couple married, Mr. Squadron confided to the senator that Ms. Weinstein was pregnant. Mr. Schumer was so excited that he blurted it out at a news conference — not knowing that the couple had not yet told friends and colleagues. Mr. Schumer often says his biggest regret was not having more kids. “Everyone has a hole inside themselves,” he said. Schumer couples, in turn, often find ways to recognize the senator’s role in their lives. Farrell and Elizabeth Sklerov, who met while interning for Mr. Schumer in 2003, named their black-and-white Shih Tzu after him. Mr. Schumer, whose wedding in 1980 was encouraged by a colleague in the New York State Assembly, said his goal was to ensure that the people under his charge could prosper without sacrificing happiness at home.